At Murphy Family Dentistry, we believe that it’s never too early to start prioritizing oral health, which is why Dr. Najari and Dr. Nguyen are always happy to welcome in the youngest members of your family. We take a gentle, kind approach with children, matching our care to their unique personality and level of emotional maturity in order to create a positive experience. Dr. Najari was even voted as one of the best general dentists in Child Magazine! Contact us today to schedule a first visit for your son or daughter, or if you have any questions. 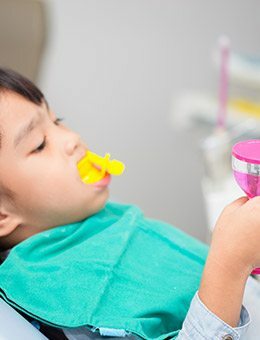 Why Choose Murphy Family Dentistry for Children’s Dentistry? Just like adults, children also need to be visiting a trusted dentist’s office for routine checkups and cleanings every six months on average. These important visits give our team the opportunity to review their existing teeth (baby and adult alike), their gum tissue, their resting bite, and other components that make up their oral health for signs of damage or decay. We will also be sure to pinpoint potential developmental concerns as soon as they appear so that interceptive treatment may be possible. We understand that some patients, especially younger patients, need extra protection against cavities. That's why our Murphy office offers dental sealants. This simple but effective service puts a thin layer of tough coating between the vulnerable chewing surfaces of the patient's teeth and the harmful bacteria responsible for causing cavities. Treatment with sealants only takes a few minutes but provides years of protection. Countless studies have demonstrated a clear positive link between safe exposure to fluoride (a natural mineral) and stronger, healthier tooth enamel, especially in children. Fluoride is available in many oral hygiene products and most tap water sources, but if your son or daughter isn’t receiving as much as they should, our dentists may also recommend professional fluoride treatments here in Murphy. This easy application can be incorporated into their checkup and cleaning and completed in a matter of minutes for optimal convenience. Is your son or daughter a burgeoning athlete? 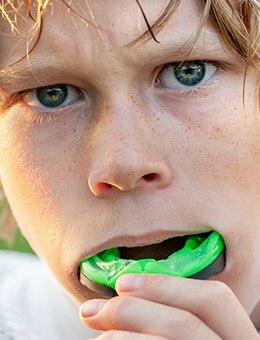 If they regularly play sports that involve the possibility of physical contact (whether with hard objects or other players), it’s very important that they wear a sports guard to protect their teeth from harm. At Murphy Family Dentistry, we can create high-quality, fully customized appliances that will be a good fit for their unique smile, providing plenty of flexibility, sturdiness, and comfort throughout each game. 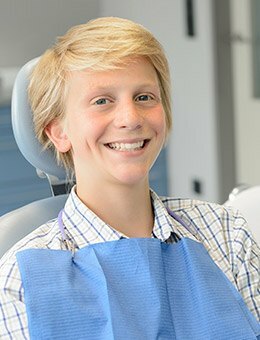 If we discover signs of decay in your child’s smile, a tooth-colored filling can help repair the damage conservatively and attractively. Instead of dark-colored amalgam, our dentists will place flexible composite resin, which comes in a wide variety of enamel-like shades that can be precisely matched to their tooth’s color. The lack of metals also means that the filling will feel more comfortable when eating hot and cold foods.